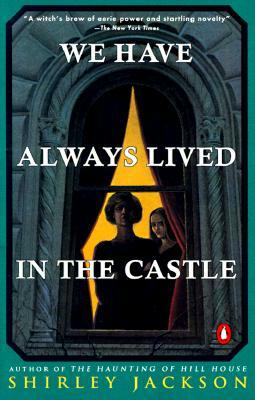 I ‘secretly’ checked out We Have Always Lived in the Castle by Shirley Jackson from the library last week, not daring to mention it in my Library Loot post in case I excited the hopes of Jackson-loving bloggers who have been disappointed before when I’ve checked this out only to return it unread. After a bit of public shaming, I vowed that 2012 would be the year I finally tried this short novel. And so I did. The story is told by Mary Katherine Blackwood (‘Merricat’), who has lived with her elder sister Constance and Uncle Julian in virtual isolation since the arsenic poisoning deaths of the rest of the family years before. Merricat is the only one who ever leaves the family property (Uncle Julian being confined to a wheelchair and Constance held captive by her agoraphobia), braving the gossiping townsfolk to buy groceries and pick up library books. They are outsiders but relatively contented ones, though, to the reader, quite mysterious and odd even among themselves. Then Cousin Charles arrives and begins to upset their ordered if not quite ‘normal’ lives. After reading that, I did hope I’d be as enthralled by this book as so many other readers seem to be. But that did not happen. I discovered that I love Jackson’s writing style but I just could not interest myself in her content. I did have one momentary, horrifying flashback to “The Lottery” when the villagers began behaving as Jackson’s villagers are wont to do, but mostly I was bored. I don’t think that is any particular reflection on Jackson, it just seems to be my general response to anything with an even remotely Gothic tone. I didn’t find it suspenseful or intriguing and, when that’s the major selling-point of a novel, missing that kind of tension does tend to take away from the experience. I’m very glad I finally tried it for myself though and I can easily understand why other readers love it so much, it just doesn’t appeal to my tastes. I love the title, I love the opening, and I love the way Jackson writes a sentence but, as I whole, I was completely indifferent to this story. On the other hand, I now can’t wait for my already ordered copy of Jackson’s amusing, domestic, Provincial Lady-esque Life Among the Savages to arrive. Oh dear Claire! Good job you kept it secret – sorry you didn’t enjoy this, I shall remember that you definitely *don’t* like Gothicky books, but I am still supremely hopeful for Life Among the Savages. It really couldn’t be more different. And you’re forgiven everything for your lovely comment on the Warner/Maxwell letters post. I’m thrilled that you’re loving it as much as I did! I did try, Simon. But yes, I think Gothic novels are just beyond me. This certainly hasn’t put me off Jackson though and I can’t wait to read Life Among the Savages! Words continue to fail me when it comes to The Element of Lavishness. I finished reading it on Friday and haven’t been able to start anything since; I just want to hold on to the joy I experienced while reading it and the love I have for Sylvia and William. I am disappointed that you have not joined the throng of readers who have loved this book. I have not read it (simply because it is not accessible – as yet). I intend to get to it one day. I hope when you do get a chance to read it, Mystica, that you enjoy it! I agree with you about the brilliance of the opening passage! If you like Life Among the Savages, there’s also the sequel, Raising Demons. I’m almost sure I’ll like Life Among the Savages and the good news is that, unlike Savages, my library does have a copy of the difficult to obtain Raising Demons available. I’m all set! Amazingly enough I have also just finished this novel, having meant to read it for several years. I liked it more than you did, and will be reviewing it in the next few days. I’m glad you enjoyed it, Harriet. How strange that we were reading it at the same time! Good for you for taking a stab at it and for being so honey, Claire. I find it a noble thing to do. I’ve not read this. I’m still stunned by “The Lottery”, which I read more than 40 years ago – and it still haunts me. Thank you, Penny, I knew I couldn’t be the only one carrying a deep-rooted phobia of Jackson based on the emotional trauma caused by “The Lottery”. This is no where near as chilling as that story, thankfully, but that is what had kept me away from it. I wouldn’t feel too badly about this, if only because I also was less than enamored with this one when I read it! I had only heard raves when I picked it up, and while there wasn’t anything ostensibly wrong with it and I certainly didn’t dislike it, I just felt detached from it. I definitely don’t feel bad because it wasn’t that I hated the book, I was just, as you say, detached from it. I can completely see why other people love it, I’m just not one of them. Glad to hear I’m not alone! Now I feel the shame! I’ve had this book for several years and I still haven’t read it. But how disappointing, to find it didn’t affect you after all that. I really didn’t feel that disappointed, just intrigued that it didn’t affect me. I was very impressed by Jackson’s writing, which was a wonderful take away for me, but I was just indifferent to the story. I hope you enjoy the book when you read it! Fair enough, fair enough. I’ll just say, I had this same response when I read this book in 2006, and when I read it again in 2011 (or 2010 maybe) I loved it. Just throwing that out there. Fair enough, Jenny. I’m glad that you had such a positive turn around on rereading the book! I liked this book a lot … enough to take a quick reread through it right after finishing it to see how Jackson structured the story and created her effects. There are only a very few writers I will do that with, the others being Flannery O’Connor (also a pretty Gothic writer) and Muriel Spark. Even if you didn’t care for this one, Savages may appeal to you. Very enjoyable. If you are enjoying the Warner-Maxwell letters (about to move from my shelves to my nightstand, I can highly recommend the Warner-David Garnett letters. She structures it brilliantly, doesn’t she? Maybe because I wasn’t enthralled by the story, I was able to appreciate the skilled construction as I was reading and that did impress me. Thanks for the Warner-Garnett recommendation. I ADORED the Warner-Maxwell letters (you have such a treat in store!) and while I don’t feel particularly desperate to read the fictional works of either author I am eager to read more of their other letters. I loved that you kept it a secret. Sorry it didn’t live up to expectations. Expectations were pretty high so I too am a little sad that I didn’t love it but I’m really pleased I finally tried it for myself. It’s quite a quick read once you get started (Jackson’s writing makes it difficult to put down once you start so, for me, it was a very quick read indeed one afternoon) but, whether it’s next October or some time before or after, I really do hope you enjoy this as much as everyone else seems to! I may not have loved it but I can see why people would, especially if you enjoy Gothic elements. “Savages” is about as far away from “We Have Always Lived in the Castle” as you could get. And very, very funny. I hope you enjoy it. So do I! I’m very excited to read it. Oh, dear – what a shame. but didn’t you love the food? I’d forgive a lot for those rum cakes. It’s true! I came away very hungry after reading this, with an almost desperate desire for pie. Just finished the book. Loved it!